Warm milk beverages, served lightly sweetened or flavoured with exotic nuts and warming spices have always been a part of India’s culinary legacy. Before the British East India Company started mass production of tea in India in the 1600s, milk was the beverage of choice in the Indian subcontinent. There are many references to the drinking of spiced milk in the vedic texts. 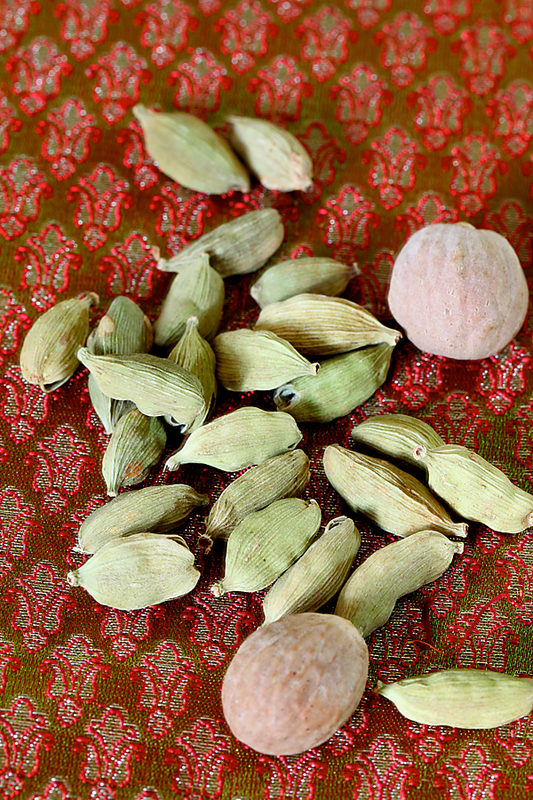 Milk imbued with spices and nuts was an important part of royal meals. 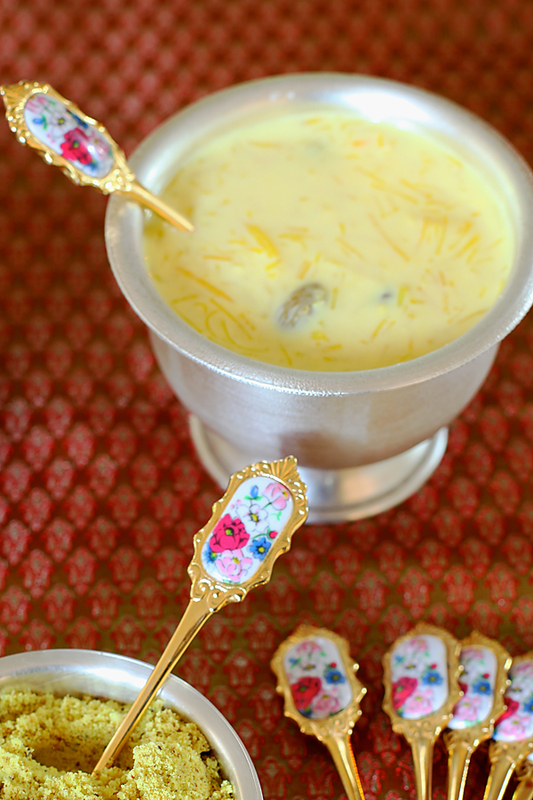 Guests would be welcomed with saffron and cardamom infused milk. This tradition continues till today in many households and festivals and celebrations are replete with spiced almond or pistachio milk. If you like me are skeptical about pre packed cartons of masala powders, this can be a natural home made alternative to store bought badam (almond) milk powder. At times, I mix this nut and spice rich powder into Hari’s milk to cut the monotony from his regular carob milk. It is not only delicious but also nutritious. 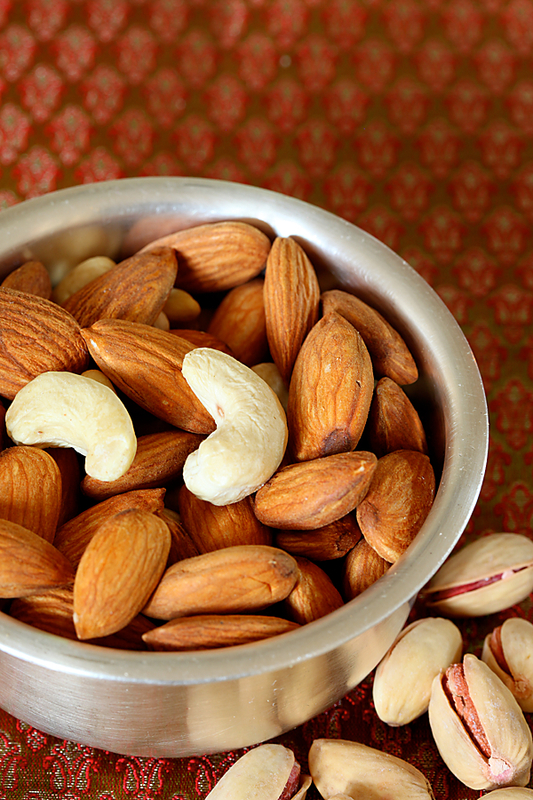 The healthful properties of almonds and other nuts are well known today and this is a great way to incorporate nuts into a diet, especially a child’s diet (provided your child is not allergic to milk or nuts). Apart from being stirred into milk to be drunk as a beverage, this powder has other uses too. 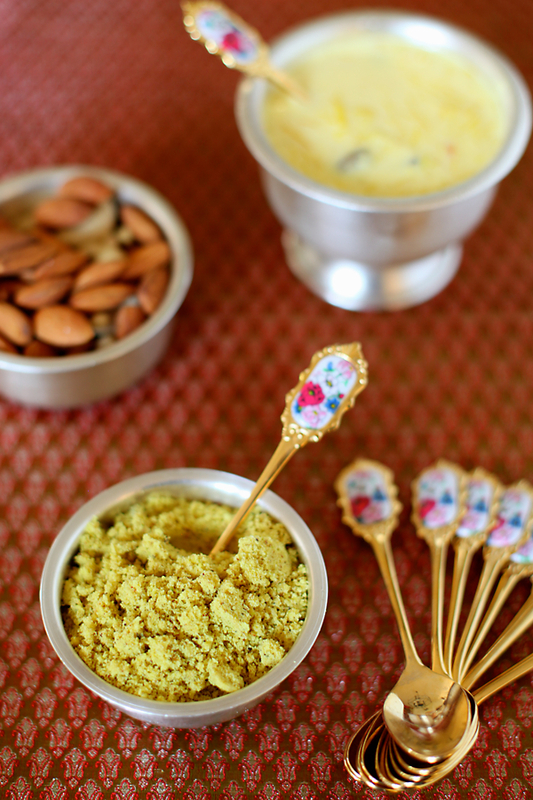 It can be stirred into payasams and kheers (milk puddings) to give them extra taste. It could also be mixed into accompaniments to sweets like rabri and pheni. Serve this exotic milk beverage to your guests as a warming drink or chilled during summers. It fits in excellently into a party menu. Or savour it when you are in the mood for something traditional and exotic and want to relive a royal repast. You can use cow milk or soy/almond/ rice bran or any other milk of your choice to make this drink. You could also use a single nut or vary the nuts used for a change in taste. In a wok or a heavy bottomed skillet, place the almonds, cashews and pistachios and roast over low heat for 4 to 5 minutes. Make sure that the nuts don’t get black. Cool completely. 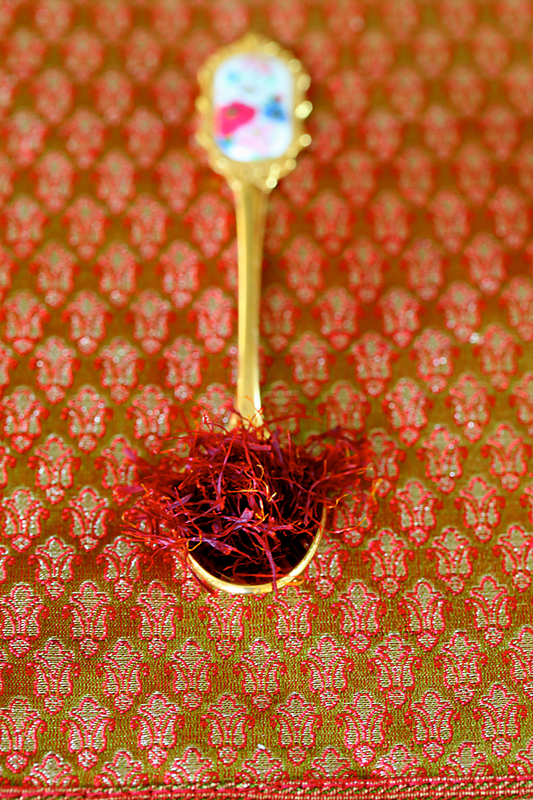 Place the saffron strands and gently heat for a few seconds. Crush to a fine powder using a mortar and pestle. In a coffee grinder or blender place all the nuts and spices, almonds, cashews, pistachios saffron, nutmeg, cardamom, pepper if using and the sugar and pulse until finely ground. Do this in spurts and with a gap of 30 seconds. If you keep the motor running continuously you might get a paste instead of powder as the nuts are oil rich. Stir in the optional turmeric powder and store in an air tight container. Stir in 2 tsp or 1 tbsp of this powder into warm milk of your choice. Mix well with a spoon. You might want to place this powder in the cup first, add a little milk, mix and add more milk and mix if you don’t want any lumps. Add additional sugar to taste if required. Serve hot, warm, at room temperature or chilled. Note: You can store this mixture for upto two weeks. It is better to store it in the refrigerator and not for a long period as the nuts can turn rancid. Hi Anushruti. Seems a very healthy option that can replace my store bought badam milk powder. One Q. Can this be given to babies of around 9 months old.? Loved the pictures, very very beautiful, your pictures make food more appealing. 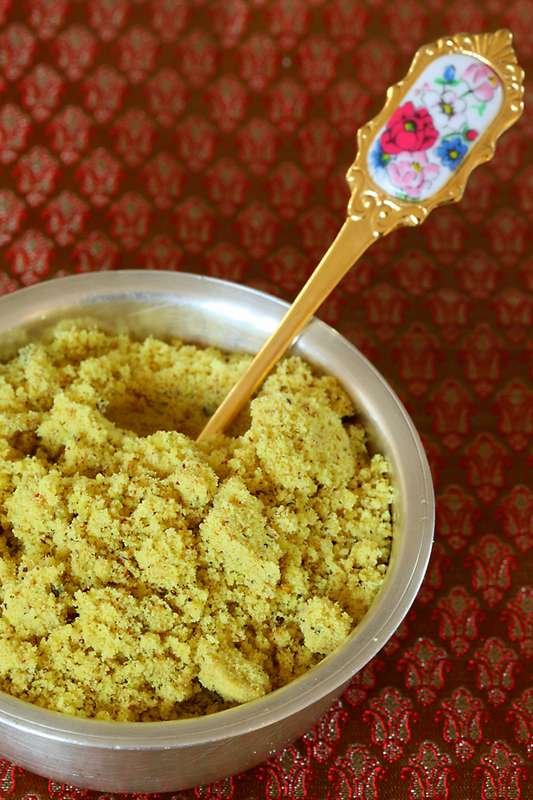 Was so awestruck by photos, forgot to talk about milk masala powder, I agree very tasty I have always loved it, but I have always made without haldi. Have tried many recipes from your blog n they are all HIT.Thankyou. Nice post! Great pictures, as always 🙂 I would also like to try adding this powder to milk while making kulfi candies..
Anu, Can you also please post the recipe for Kashaya Powder used to heal cold and temperature? I know its pretty common in Havyakas & Mangalorean households. Thanks! Cool pics, and this looks so exotic and tempting! Pratiba: This can replace your store bought badam milk powder, especially if you make it only with almonds. I remember grating one almond into Hari's porridge after he was 6 months and until he was a year old. In my opinion, all the nuts except almonds might be difficult for the baby to digest at 9 months. But, again every baby is different and I remember a relative giving cashew in the porridge. But, if you want to err on the side of caution, wait until the baby is 1 year old. Dr. Preeti: Thanks for your compliments. The turmeric is optional and I myself don't add it always as I prefer to get the colour from saffron. It is used here to aid the saffron in making the golden yellow colour more prominent. Ashwini: Adding this into kulfi mixture is an awesome idea. Will surely post a kashaya recipe. I have to confess that I have been following your blog almost voyeuristically for a while now :-). I especially like your Indian recipes. Your photography style is really wonderful, the photos are very professional. This powder reminds me of this wonderful warm flavored milk I occasionally have at a restaurant here. I am so going make this. Wouldn't be easier to grate the nutmeg than using a coffee grinder or a mortar-pestle? Isn't nutmeg just too tough for either of those contraptions? Keep posting your delicious recipes. Sylvia: Yes, you could grate the nutmeg. I always tend to use my mortar and pestle. It is a personal choice. And thanks for your note. Appreciate it! I am in my second trimester..can I used this recipe for almond milk. Also when do u start taking saffron in Pregnancy because I heard it causes a lot of heat in the body? Madhu: Yes you can! A pich of saffron after the first trimester generally safe. I remember taking it..I think in the last trimester. Hi, Happy new year to you. I made this recipe twice and honestly milk tastes 'divine' with the masala added to it..thank you. I follow your blog quite regularly & have tried out many recipes are rally so good. I made this for Lord Narasimhadev on the occasion of Narasimha Caturdasi – it was indeed a drink fit for the Gods!! Thanks so much for sharing the recipe with us. Divyangi Lalita devi dasi: Feel blessed. Thanks for the feedback! I tried this recipe on Holi and I must say it is really a very delicious hand healthy drink.Everybody at my house liked it alot.Thanks for sharing such a yummy recipe.